You'll be £19.99 closer to your next £10.00 credit when you purchase War For The Throne. What's this? The opening years of the fifteenth century saw one of the most bitterly contested political and military convulsions in the history of the British Isles, a conflict that is too-often overlooked by military historians. Henry IV, who had overthrown and probably murdered his predecessor Richard II, fought a protracted and bloody campaign against the most powerful nobles in the land. This war is the subject of John Barratt’s gripping study. The Percy family, the ‘Kings of the North’, and their most famous leader Sir Henry Percy – ‘Hotspur’,whose fiery nature and military prowess were immortalized by Shakespeare – stood out against Henry’s rule. And the beleagured king also had to contend with a range of other unrelenting opponents, among them Owain Glyn Dwr, who led the Welsh revolt against English supremacy. In this graphic account of the first, deeply troubled years of Henry IV’s reign, John Barratt concentrates on the warfare, in particular on the setpiece pitched battles fought at Homildon Hill, Pilleth and Shrewsbury. His story brings to life the embittered politics and the personal and family enmities that gave rise to armed conflict. And he describes in vivid detail the tactics and fighting methods of the day, which were dominated by the devastating power of the English longbow. In this graphic account of the first, deeply troubled years of Henry IV's reign, John Barratt concentrates on the warfare, in particular on the set-piece pitched battles fought at Homildon Hill, Pilleth and Shrewsbury. His story brings to life the embittered politics and the personal and family enmities that gave rise to armed conflict. He also describes in vivid detail the tactics and fighting methods of the day, which were dominated by the devastating power of the English warbow. Complimented by a wealth of contemporary accounts, supplemented by modern research, maps and illustrations of the battles, the book should appeal greatly to all with an interest in medieval history or for those wishing to learn more about this brutal period. The book is not-and did not set out to be - the definitive, scholarly tudy on the subject, but is more like an extensive battlefield guide; the author has written on a wide range of military topics, mainly of the Civil War. The battle of Shrewsbury is probably best known for the blooding of Henry V to be. In the Welsh wars (up to 1410) that followed, he learned the military trade of raid, ambush and siege; an apprenticeship for his conquest of Normandy a decade later. The conflict was a product of the usurpation of his father Henry IV (Bolingbroke) in 1399, one of several resulting rebellions, but the most dangerous, led by Henry Percy "Hotspur" - son of the earl of Northumberland. His alliance with the revivalist Welsh prince Owain Glyn Dwr, in revolt since 1400, created a political and military threat that had to be met in open battle. The royal army probably outnumbered the rebels by 2:1 and its superiority in archers forced Hotspur to take the offensive. He was nearly successful as Prince Henry was shot in the face by an arrow and the royal standard bearer killed, but the rebels were eventually overwhelmed and he died in the rout. King Henry built a chapel a chantry chapel on the site, now a largely Victorian church which stands in a well-interpreted battlefield park. The book's illustrations include black-and-white photographs showing the wider context of the war, with eight campaign and battle maps, although these are rather simplistic and all lack a scale. The text is a mixture of narrative and topic boxes (dealing with tactics and weaponry), both demonstrating the author's sound grasp of his material. Above all, he presents a balanced view of the value of archery in battle, avoiding a celebration of the longbow alone. The battle of Shrewsbury involved two of the most famous figures in English history, the future Henry V and Sir Henry 'Hotspur' Percy, son of the Earl of Northumberland. It took place against a backdrop of usurpation, and the Glen Dwr revolt in Wales, in the dramatic early years of the reign of Henry IV. Despite its significance the battle and the struggle it was part of are often skipped over, coming between the two main phases of the Hundred Years War and well before the accepted start of civil war in the reign of Henry VI. 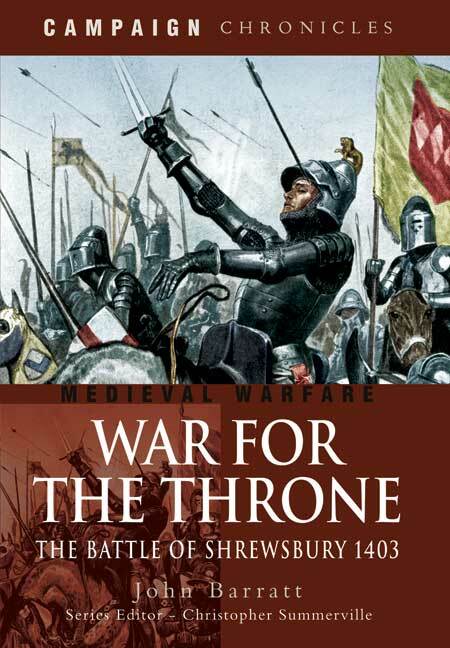 The campaign and battle of Shrewsbury itself takes up about one fifth of the text. The bulk of the book looks at the other military events of Henry IV's reign, starting with the early clash with Scotland and Glen Dwr's revolt. Barratt looks at how the pressures that built up during these conflicts slowly eroded the Percys' support for Henry, eventually leading first to Hotspur's short-lived revolt that ended at Shrewsbury, and then for his father's longer, but no more effective rebellion. While this might make it a stretch to call this a campaign history for the battle of Shrewsbury, it does make it a much more valuable book. Hotspur's rebellion was a short-lived affair, and the battle of Shrewsbury not complex enough to sustain an entire book aimed at the general reader, but they did form an important part of the wider story of Henry IV's reign. By expanding his focus out to look at the entire story of the opposition to Henry, Barratt reminds us that these events were interrelated, with even Glen Dwr's revolt triggered at least in part by dissatisfaction with the new monarch. Barratt paints a vivid picure of such battles as Pilleth in Wales, Homildon Hill in Scotland and of course Shrewsbury, so bloodily fought at Battlefield (as of course it became known) just outside the town, explaining the tactics and fighting methods of the time, and highlighting the dominance of the terrifying English war-bow and its devastating power. I've never read a military history book for pleasure, but Barratt's clear and concise writing style made this one surprisingly easy to work through. Illustrated with photographs and maps, this is definately a book for the military enthusiast. The Battle of Shrewsbury was fought on 21st July 1403, waged between an army led by the Lancastrian King, Henry IV, and a rebel army led by Henry "Hotspur" Percy from Northumberland. Although the battle was won by King Henry, The King's forces sustained much greater losses than the rebels. The tactics and fighting methods of the day were dominated by the devastating power of the English longbow. It was noted that the King's men "fell like leaves in Autumn, every one [arrow] struck a mortal man".